6 Bedroom all with ensuite & individual AC control - Be prepared to be spoiled. Casa Stephens, 'Fantastic' would be an understatement. "The photos simply do not describe your villa"...this is the comment we hear from our guests once they arrive into our villas. From the moment you arrive into Cabo, our luxury, private car service delivers you and your guests to the villa where our concierge greets you with fresh margaritas, chips, salsa and home-made guacamole. With over 10,000 sqft of indoor/outdoor single-level luxury living space, top quality brands such as SubZero, Wolf, Sharp, Sonos, AppleTV and Sony are employed, delivering the quality you deserve. We paid attention to the smaller details such as solid brass, 50 year old ship lanterns that gently lite the exterior columns and pool patios. Both of our villas (we own Casa Contessa across the street if you need 5 more bedrooms) even include BlendTec professional blenders for the serious smoothie and blended cocktail bartender. Search on our private websites for more details and photos. Other properties simply cannot match our overall size and quality. The Master and Junior Master Suites provide huge Ocean Views and include indoor and outdoor showers enabling you and your guests to enjoy the very private ocean view, fresh ocean air and sounds. The Master and Junior Master Suites are just steps away to the private pool and jacuzzi. Additional luxuries include 700-thread custom bedding & robes for visitors as well as 'Esperanza Resort' bathroom products. The 80' Sharp LCD TV in the living room is connected to USA Satellite Network with premium channels included. The Master and Jr. Master bedrooms offer Sharp & Sony Flat screens with BlueRay WIFI DVD players with NetFlix. The detached Casita is the 6th (very private) bedroom offering a king bed and 50' LG Flat Screen connected to a BlueRay WIFI DVD player. This Private Casita also includes a mini kitchen with fridge, microwave, and sink as well as tiled custom shower with bench seating for two. Need some entertainment for the kids? How about ping pong, Wii or DVD movies ranging from the 'Apple Dumpling Gang' to 'Wedding Crashers'...over 40 movies for all ages. Do you like music? How about Sonos powered sound throughout the villa and pool decks allowing you to connect your iPod, iPad or MP3 player. Casa Stephens' daily concierge and every-other-day maid service is, of course, provided and can be 'fine-tuned' to the guest's individual needs. Want breakfast ready for your guests or kids in the morning? Your concierge Baruch will make the arrangements. Our guests can make reservations at the World Famous Esperanza Alberge Spa offering an assortment of custom body treatments as well as reservations to the Esperanza restaurants for breakfast, lunch and dinner. Esperanza pools and gym access are not permitted, however, full access to our incredible beach front Members only Beach Club and Gym is provided to our guests and offers towel service and full food and beverage services...all ocean-front! If you want to experience the vacation of your lifetime, Casa Stephens is the answer to your vacation dreams. In January of 1994, we vacationed in Cabo for the first time and stayed at the Melia. When we left Virginia that January, the temperature was 5 degrees. Needless to say, we needed some warm weather. When we arrived in Cabo, the temperature was 82 degrees and was perfect during the week of our stay. We were so impressed with the friendly people, food, weather, and golf courses that we purchased a time share where we locked-in week one (first week January) every year. Every January from 1994 through 2006, we vacationed in Cabo without missing a single year. After loads of research and visits to various communities, we purchased the perfect lot within the Punta Ballena development to build our dream villa and future retirement home. Our back-yard (pool deck, three bedrooms and living room) faces directly South into the Sea of Cortez and has a complete unobstructed ocean view. Additionally, Punta Ballena offered state of the art infrastructure, security, fantastic amenities and close proximity to the town of Cabo...yet, far enough away. With Cabo Del Sol Golf Course one exit down. This championship layout is praised by Nicklaus himself for having the “three finest finishing holes in all of golf.” The 5th and signature 17th holes are currently ranked among “The 500 Best Holes in the World” according to Golf Magazine. 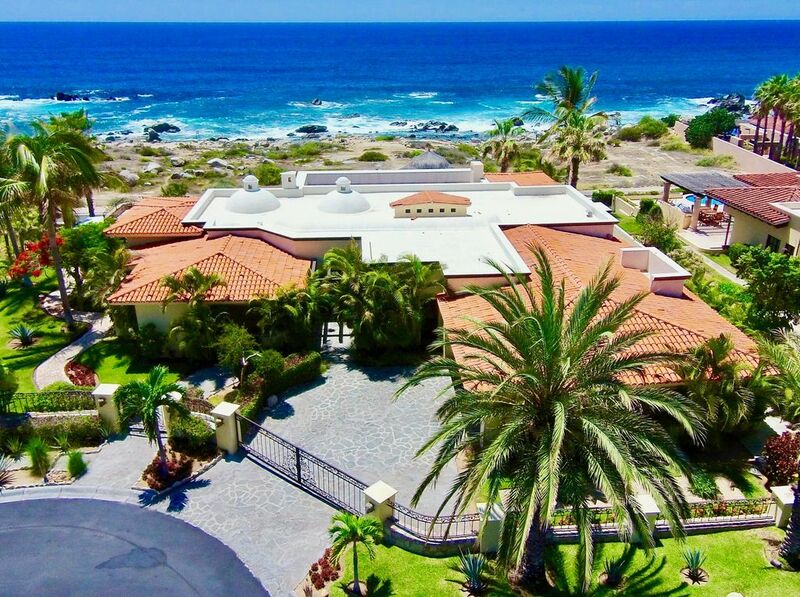 Additionally, Cabo offered close proximity to the United States and we believe that when our children are grown with our grandchildren, they will want to visit us in Cabo because of our weather, location, safety and 5 additional bedrooms. We are looking forward to those days. Punta Ballana is the community where the Esperanza Resort (an Alberge Resort) is located where you and your guests can enjoy and have access to their SPA shopping & dining facilities. Our community also has two tennis courts and a 2 mile nature walking path that is groomed daily. toilet, shower, Shower window opens to garden view..very nice! All bathrooms are custom, natural stone tile with Kohler sinks and toilets. All faucets are custom pitted oil rubbed bronze finished matching all door hardware and custom door hinges. Casa Stephens is a two minute walk to the water's edge. This beach is a crowd pleaser, having both soft sand and large boulders; great for exploring, shelling, and sea-glass hunting. Esperanza Resort is a 5 minute walk from the villa. You and your guests can enjoy spa treatments, dining, and boutique shopping. Casa Stephens is located on row 2. The beach-front lots are vacant, allowing for outstanding sunrise views over the ocean. The beach is comprised of both sand and boulder rocks. Complete ocean view from the living room, master bedroom & jr. master bedroom. The ocean is a short 70 yards away, allowing you to hear the crashing waves while lounging on the pool deck. Casa Stephens is located on row 2. Ocean-front lots are vacant, allowing for outstanding ocean views. The waves crashing over the rocks make for peaceful evenings on pool deck. Each bedroom has individual Carrier air conditioners that were replaced in 2013. Yes, but candles only please. 2 car garage, room for one car. Full access to the members only ocean front gym and beach club. New treadmills and ellipticals just arrived in December, 2017! 800 SQFT Living Room with 30 foot pocket door leading to the 400 SQFT shaded lanai that looks over the pool and ocean. New 80' Sharp LCD installed in 2014. Top of the line Fortessa Bone china. More than you will ever use during your stay. Sub Zero Pro G fridge with Wolf PRO Series Range, warming drawer & Microwave. Sonos system with iPhone docking station. Makes sure you download the free Sonos app to your smart phone. From the garage and driveway there are no stairs. Additionally, there are no stairs inside the house or from the house to the pool patio. Casa Stephens is the type of place you will hate to leave and never forget...this is the reason we have many repeat clients. We set the standard in over-delivering expectations for you and your guests. We simply do things right. WE DO NOT MISLEAD OUR CLIENTS WITH FALSE STATEMENTS. BEWARE: THERE ARE SEVERAL LISTINGS THAT OVERSTATE THEIR SIZE, SLEEPING ARRANGEMENTS, PROXIMITY TO THE OCEAN & OCEAN VIEWS. ALSO ASK ABOUT CONSTRUCTION NEARBY. ALWAYS REMEMBER - YOU GET WHAT YOU PAY FOR. ALSO, THERE ARE SEVERAL LISTINGS WHERE THE VILLA IS NOT LOCATED IN OUR COMMUNITY. ASK QUESTIONS!! Third Visit to Casa Stephens - It only gets better every time! This house is perfection! Nestled on the Southern-Tip of Cabo san Lucas, the location is close enough to shops, restaurants, golf courses, and other attractions yet it offers complete privacy directly on the the Sea of Cortez. The design of the house provides the perfect opportunity to enjoy "Cabo Life", "No Bad Days" at its best. From the beautifully landscaped backyard and infinity salt water pool, you can see whales during season and fish jumping every day as well as cruise ships sailing into the distance. The pool area and swim-up bar in the backyard is the ideal gathering place with such an incredible view and plenty of chairs and tables for eating, drinking, and soaking up the beauty of the surroundings. Every detail from the professional kitchen with that glass-front SubZero fridge down to the Kettler ping pong table is top shelf. The house has classic yet comfortable decor and is designed around an open great room complete with wet bar. The bedrooms are restful retreats with privacy and individually controlled AC systems that will freeze you out of the villa. Our family stayed here two previous times and found everything to exceed expectations once again - we didn't want to leave! The accommodation that Casa Stephens offered where clean, beautiful views and terrific open lay out. The first day there we saw many whales and had a fabulous sunrise every morning! The property is very clean and great location to the Beach Club and Esperanza Hotel. Baruch managed all our travel with speed and was always available to answer any questions! The owner Dianne was more then accommodating to all our need. The pictures are true to the home. We would definitely rent this property again. Casa Stepehens is beautiful!! With 4 of our closest friends, my husband and I celebrated our joint 50th birthdays at this incredible house... Ocean views, lovely pool, beach access and great Esperanza Beach Club! The house is enormous, beautiful decor, all the amenities you could ask for. House is ideal for a large group. Barcuh was very helpful. We definitely plan to stay here again! Thank you, Dianne. Your help and guidance in planning this event was First Class! Wonderful experience renting Casa Stephens in spring 2016! Many thanks to the Stephens and their local team for helping us with a great spring break experience renting their home in the Esperanza resort in Cabo San Lucas. The house is situated in an ideal location for unobstructed views of the surf, direct access to the beach and all the other resort amenities and this gave us an opportunity to choose different ways of spending time in Cabo all within the Esperanza resort. The accommodations were ideal for a large group and the local staff was responsive when we had specific requests and needs. The rental process was handled professionally, the owners were attentive and phoned upon our arrival to make sure all was well, for a unique experience we highly recommend this option. Just wanted to drop you an email and let you know we had a wonderful stay at Casa Stephens. What a great way to celebrate a birthday! The house is awesome and looks even better in person then it does on the website. I was impressed with the furnishings and the Sonos sound system was a nice bonus. The unobstructed views of the ocean are extraordinary. Baruch was great to work with and took care of everything we needed. We had several meals at the Casa supplied by Baja Cooking and Catering. If you ever need a chef, Rafael was great and every meal was perfect. He even supplied my birthday cake with one of our dinners. His pricing was extremely reasonable. When I was planning this trip, I compiled a list five houses that I was interested in renting. Your quick communication and personal attention was a deciding factor in choosing Casa Stephens. I had a chance to drive by two other properties that where high on my list, but neither one of them impressed me more than Casa Stephens. I will definitely be choosing Casa Stephens for future group trips to Cabo. My wife and I have been coming to Cabo for 18 years and this trip is going to be hard to top. There might not be two more beautiful homes in Cabo then Casa Stephens and Casa Contessa. We rented both homes for our wedding at the Esperanza this past December. While the Esperanza is gorgeous and hard to beat, you will not be disappointed with Casa Stephens and Casa Contessa. Great views with spacious rooms both houses provide the unique experience of a luxury vacation along with private quality time with family or friends. The owner Dianne was extremely helpful and accommodating. The ease in which we were able to work with her was a huge relief while juggling all the wedding details. If you are planning on visiting Cabo with a larger group, you have to consider staying at Casa Stephens or Casa Contessa. We will definitely be back for another amazing stay at these incredible homes with outstanding owners! Fantastic location with outdoor activities such as tennis, sea shell and sea glass hunting, walking and running trails, full food and drink services at our ocean-front, members only Beach Club all only a 5 minute walk from the villa.